I hope Richard doesn’t mind me going tonight with this but as the two countries face each other in the world cup tonight it seemed a good time to announce our fifth Spanish lit month well we do it for two months now and have expanded to include Portuguese literature as well for a second year. This years is an image of Lisbon I have change with the Prisma programme. I am looking forward to seeing the wide variety of books we get Richard usually rounds up through the month I will happily tweet any reviews on twitter. There is a list of the spanish speaking countries from the first Spanish lit month. Here is another of the Portuguese speaking world.I will be featuring more Portuguese novels this year. As the last year, I have been buying a lot of books from Portugal to try and build up this area on the blog. We have chosen one read along well I have I think Richard may want to choose a Portuguese novel as I choose this. 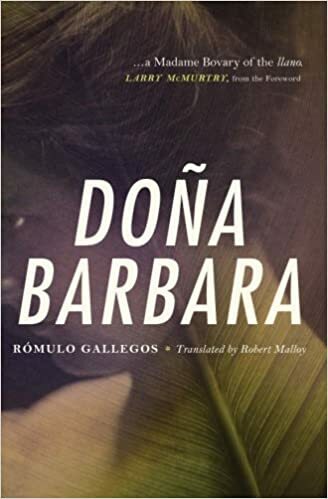 Dona Barbara is considered one of the greatest Latin American novels. It is in the list of the 100 best novels from PBS . This for me also has themes in the book are ones I love the clashing of traditional and modern ideas within a society, the clash of city and country. It has been made into a couple of films and is considered one of the best portraits of Venezuelan society at the time the book is set. We are thinking of posts in the last week of August and discussing the book around them. We can also talk on twitter about the book. Sorry update we running this over July and August .